Isonokami Jingu (石上神宮) is one of the oldest shrine located in Nara. It's been highly respected as the shrine of Mononobe clan. Mononobe clan was the head of old imperial army. It enshrines the divine sword of the Emperor Jinmu. This sword was carried from Korea in 4th century. It was established in the time of the 10th Emperor Suijin. This shrine appears as Jingu in Japanese Myth, Nihonshoki. 1. use JR Sakurai Line to Tenri Station. Enshrines: Futsunomitamanoookami, Furunomitamanoookami and Futsutamanoookami. Isonokami Jingu is a Jingu Shrine is one of the oldest shrines in Japan. It is located in Tenri, Nara prefecture. It is the shrine of Mononobe clan that is the head of the imperial army. It enshrines the divine sword of the Emperor Jinmu, called Kunimukeshinotsurugi that was used for the Emperor Jinmu's eastern suppression. This Jingu was established in the time of the 10th Emperor Suijin. It is the only shrine, besides Ise, that entitled as Jingu in Japanese Myth. The main building was removed from the imperial palace in the late Heian Period. There are many ancient swords in this shrine. Espeically, Nanatsusayanotachi was carried from Korea in 4th century. The National Treasure of Japan. It was donated in 1081. 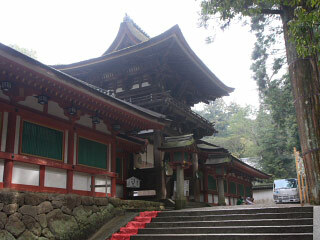 It is the oldest Worshiping SHrine exisited in Japan. The National Treasure of Japan. It was constructed in 1137.